Purchase orders are paper or electronic documents sent from a buyer to a vendor when placing an order for goods or services. They usually contain the name of the item, description, color, and size information where applicable, and the agreed-upon price. Vendor acceptance of a purchase order constitutes a contract between vendor and buyer. There’s no reason you have to stick with outdated and cumbersome purchase order procedures. If you’re a buyer for your organization, you draft purchase orders. Your vendors prepare invoices and receipts that usually contain information similar to what’s on your purchase orders. New or very small companies may create purchase orders as needed, on a case-by-case basis. However, once you’ve been in business for a while, even if your company remains small, you will most likely want to find ways to streamline the purchase order process. Here are some ways to do that. Maybe your business isn’t large enough to justify having an entire purchasing department. But having a purchasing manager is a good idea. When you have one person who manages purchasing activities, you reduce the risk of duplicating orders, develop stronger relationships with vendors, and can generally streamline the product receiving process and pay invoices more quickly. Having a single point of contact for purchasing is a great starting place. • Who has authority to make purchases for the organization? • Are there limitations on the dollar amount that can be spent without further approval? • How many vendors should be compared before selecting one? • How can we avoid conflicts of interest with suppliers? • What do we do if a legal issue arises? Having a paper-based purchase order process tends to lead to document overload. Multiple documents may be needed to cover the complete purchase order cycle, including requisitions, quotes, advice notes, packing slips, and invoices. That represents a lot of paper, ink, and storage space over time. Developing an electronic purchase order procedure eliminates many of these problems and ensures purchase orders won’t be lost or damaged. Electronic purchase orders are also great for preventing duplicate purchase orders and keeping track of when goods are received. Electronic purchase orders greatly reduce problems like duplicate and lost orders. 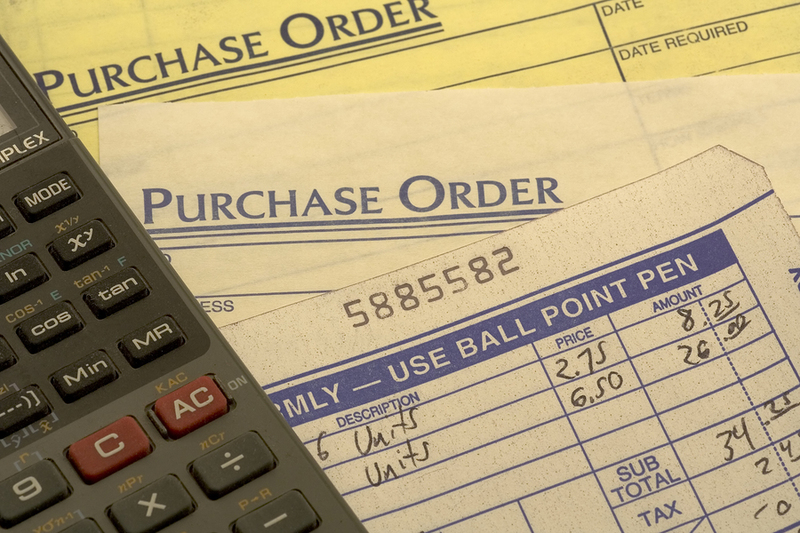 What Types of Purchase Orders Should You Have? Depending on the size of your company and the nature of the things you purchase, you may elect to have multiple kinds of purchase orders. For each of these, you’ll want to archive electronic copies for internal files, vendors, and your accounting personnel. Some organizations choose to create a “blanket” purchase order in addition to regular purchase orders. Blanket purchase orders are used when organizations routinely order inexpensive products from a single vendor, and they cover specific items to be delivered over a designated time span (like a year). The purchase order process isn’t complete once the purchase order is submitted. Your purchasing manager or other designated person (a receiving manager) should examine shipments to make sure they include what was agreed upon and that shipments aren’t damaged. Any invoices sent with products need to be collected so accounts payable can take care of them. Your purchasing manager or receiving manager should know what your different vendors’ return policies are so if there are problems, returns can be taken care of right away. Perhaps you think all of this sounds nice, but you don’t have the time or resources to have a developer create an electronic purchase order process for you. It turns out, you don’t have to. With a solution like PerfectForms, non-IT people can drag and drop elements onto custom forms, and then manage the custom forms in to custom workflows, all without ever writing a line of code. You can streamline your purchase order process and just about any other business process automation you can think of, including HR processes, maintenance requests, or registration procedures. Don’t make the mistake of thinking electronic purchase orders are only for big enterprises. PerfectForms empowers anyone to do this, and better still, you can try out PerfectForms for free. It can be made to integrate with popular platforms like Salesforce as well as with web services, spreadsheets, and databases. There’s absolutely no reason your organization has to cling to inefficient paper-based purchasing procedures. This entry was posted on Friday, September 25th, 2015 at 4:09 am	and is filed under PerfectForms, Workflow. You can follow any responses to this entry through the RSS 2.0 feed.